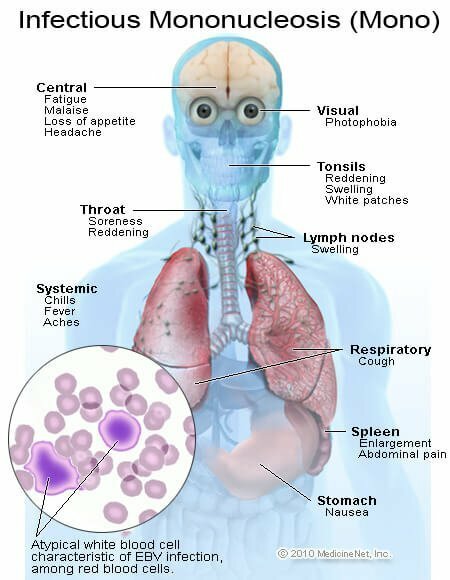 What Are the Signs and Symptoms of Infectious Mononucleosis? When Should I Call the Doctor About Infectious Mononucleosis? What Blood Tests Do Medical Professionals Use to Diagnose Infectious Mono? Are There Home Remedies for Infectious Mono? What Is the Medical Treatment for Infectious Mononucleosis? What Is the Follow-up for Infectious Mononucleosis? How Do You Prevent Infectious Mononucleosis? What Is the Prognosis for Infectious Mononucleosis? Mononucleosis is most commonly caused by the Epstein-Barr virus (EBV), and it is most frequently diagnosed in teenagers and young adults. Mononucleosis generally resolves without medical help, though it may last from weeks to months. Treatment is aimed at easing the symptoms of the illness, and it can usually be done at home with plenty of rest, fluids, and over-the-counter medications. Serious complications only rarely occur. The Epstein-Barr virus causes mononucleosis in the majority of cases. This ubiquitous, highly contagious organism is a member of the Herpesviridae family of viruses (other viruses in this family include herpes simplex, varicella-zoster, cytomegalovirus, and human herpes virus 6 & 7). Cytomegalovirus (CMV) can sometimes also cause an illness with the symptoms of mononucleosis. Mononucleosis most often occurs in people between 5-25 years of age, with the highest occurrence rate between 15-25 years of age. A small percentage of college students contract mononucleosis each year. In developed countries, it most often occurs in those of higher socioeconomic status. By adulthood, most people have had EBV infections. Not all individuals exposed to EBV, however, develop the symptoms of mononucleosis. Once infected, a person develops lifelong immunity to future infections from the disease. EBV infection has been associated with the development of certain cancers, such as nasopharyngeal carcinoma and Burkitt's lymphoma. EBV is transmitted through exposure to body fluids containing the virus (for example, saliva). EBV spreads most often via saliva (hence the name "kissing disease"). EBV also spreads through blood and genital secretions. In younger children, the symptoms may be more subtle and may additionally include irritability and poor feeding. Call a health care provider for an appointment if any of the signs or symptoms of mononucleosis appear. Diagnosis of the illness by a health care provider is important to make sure that it is not another medical condition that may require more extensive medical evaluation and treatment. yellow discoloration of the skin. Your health care provider will rely on a combination of clinical and laboratory findings to diagnose mononucleosis. They will ask about the course of the illness and perform a physical examination. A complete blood count may show the white blood cell count to be high because of the infection. An increase in a type of white blood cell called "atypical lymphocytes" is common. Health care providers often perform an antibody test to measure heterophile antibodies. Heterophile antibodies are present in about 80%-90% of people with mononucleosis. They form in response to infection with Epstein-Barr virus as well as to other infections. The treatment for mononucleosis involves self-care at home with plenty of rest, fluids and over-the-counter medications. Throat lozenges or gargling with warm saltwater may soothe a sore throat. Rest in bed and limit activity according to the degree of the illness. Avoid strenuous exercise and contact sports until the doctor allows resumption of activities. Vigorous activity may cause an enlarged spleen to rupture. Most doctors believe that a person with mononucleosis should postpone strenuous activities for at least one month after the onset of symptoms or until the spleen has returned to its normal size. Medical treatment for mononucleosis is generally reserved for those cases in which complications arise. Corticosteroids may be prescribed in rare cases of airway obstruction, hemolytic anemia (an autoimmune process in which red blood cells are destroyed), severe thrombocytopenia (a decrease in platelets, which are clotting components in the blood), and complications involving the heart and nerves. Admission to a hospital is rarely needed, unless unforeseen complications occur. Schedule routine visits with your health care provider after the initial diagnosis of mononucleosis has been made so that they can monitor the course of the illness and detect any possible complications. Wait for your health care provider to give medical clearance to resume any strenuous activities or contact sports. Though good personal hygiene makes sense, especially among teenagers, Epstein-Barr virus infection is very common in children, adolescents, and young adults, and exposure to it cannot be entirely avoided. Vaccines against Epstein-Barr virus infection do not currently exist. Mononucleosis is generally a self-limited disease that runs its course, and the infection typically goes away in several weeks (two to four weeks). Most people recover normally without any permanent health consequences. Complications are uncommon but may be life-threatening. Death from mononucleosis is very rare and most often occurs if the spleen ruptures. The spleen (which is an organ that is actually like a big lymph node) ruptures in a very low percentage of people with mononucleosis. Most of these cases occur in males. Rupture usually occurs during the second or third week of the illness when individuals start to feel better and they resume strenuous activities. If the spleen ruptures, doctors may need to surgically remove it. Airway obstruction occurs in one out of every 100-1,000 cases of mononucleosis. It may occur at any age, but it is more common in young children. Corticosteroids may be used to treat this complication. Autoimmune hemolytic anemia (a condition in which the body destroys its own red blood cells) occurs in a very low percentage of people with mononucleosis. It usually becomes clinically apparent during the second or third week of illness. Corticosteroids may be used to treat this complication. Thrombocytopenia, which is a decrease in platelets in the blood, has been noted in up to 50% of people with mononucleosis. It is usually mild and not life-threatening. If severe, corticosteroids may be used to treat this complication. Hepatitis caused by the Epstein-Barr virus occurs in a large percentage of people with mononucleosis. This condition is usually mild and goes away by itself. Neurologic complications may occur, although rarely. These might include seizures, Guillain-Barré syndrome, Bell's palsy, transverse myelitis, encephalitis, meningitis, and cranial nerve palsies. Corticosteroids may be used to treat these complications. Infection with EBV and mono may occasionally lead to a variety of malignant conditions (cancers). Omori, Michael S. "Mononucleosis in Emergency Medicine." July 24, 2018. Medscape.com. <http://emedicine.medscape.com/article/784513-overview>. United States. Centers for Disease Control and Prevention. "Epstein-Barr Virus and Infectious Mononucleosis." <http://www.cdc.gov/ncidod/diseases/ebv.htm>. What treatment was effective for your mononucleosis? What is your biggest challenge with living with mono?